In the late 1700s, when the Slade family acquired its farm in central Alamance County, the use of natural gas, the manufactured kind, anyway, in the US was still 25 years away. But in 2018, the Blanchard Farm, in the family for eight-going-on-nine generations, is known on a map as a spot between Mile Markers 64 and 65 of the Mountain Valley Pipeline Southgate project. If built, the 24-inch diameter natural gas pipeline would split the property, now co-owned by Blanchard’s daughter, Perry, Slade on the diagonal, as if her home and those of her eight family members were little more than a pizza being divvied up for dinner. 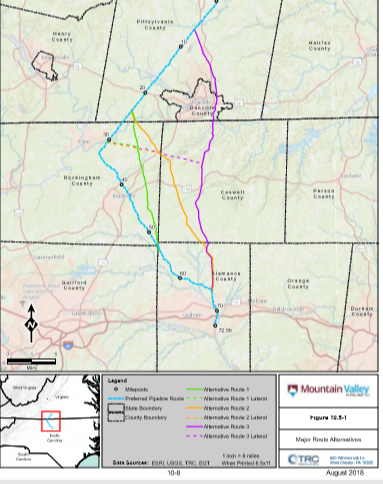 If approved by federal regulators, the MVP Southgate project, owned by a consortium of natural gas companies, would begin in Chatham, Va., enter North Carolina near Eden and continue more than 40 miles southeast to Alamance County, ending near Graham and Haw River. MVP Southgate is proposing four routes — one preferred and three alternatives. Yet all of them carve up private property, cross sensitive environmental habitats, including the Dan and Haw rivers, and further invest in fossil fuels, which contribute to climate change. At a public scoping meeting last week in Haw River, Alamance County residents poured over maps and compared notes. One woman said her 100-acre farm would be bisected under one route scenario, but only a corner would be nibbled away under another. Federal documents show that the public overwhelmingly opposes the project. They are concerned about their property values, pipeline safety, the potential damage to public and private water supplies. Predictably, the North Carolina Economic Development Association — whose board of directors in 2021 will include a representative of PSNC, the main customer of MVP Southgate — supports it. Federal and state wildlife officials submitted their concerns about the potential damage to threatened and endangered species and their habitats, including freshwater mussels, bats and bald eagles. MVP Southgate is expected to make its formal filing to FERC in November. That will trigger environmental impact statements, as well as reviews by state regulators. 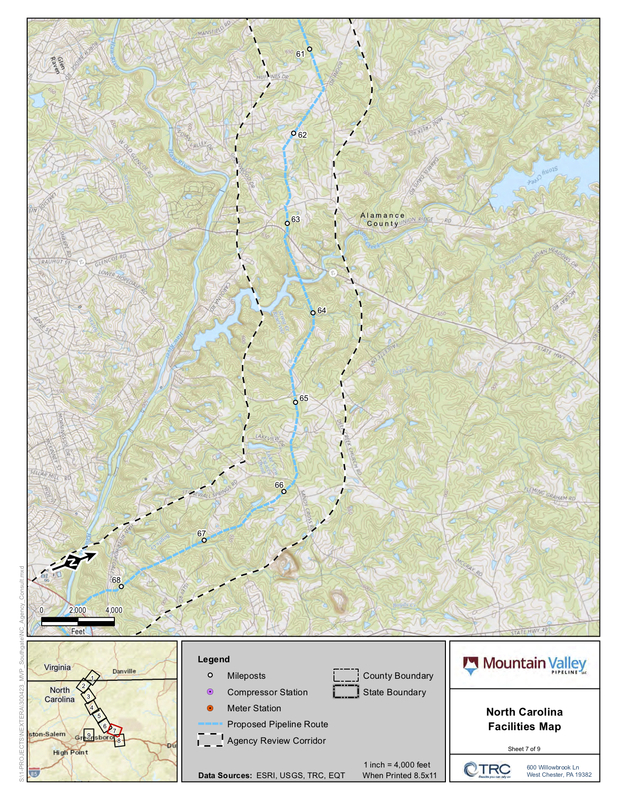 The pipeline could be in service by late 2020, MVP Southgate officials said, because it’s a “standalone project” and reportedly won’t be delayed by the legal battles that have stopped construction of the main MVP in West Virginia and Virginia. However, that timeline is likely optimistic, and delays are likely. Opponents continue to fight the Atlantic Coast Pipeline in eastern North Carolina, and construction has been halted in Virginia over impacts on endangered species. Clean Water for North Carolina filed a civil rights complaint against the NC Department of Environmental Quality contending that the pipeline disproportionately harms communities of color and low-income neighborhoods. Meanwhile, Slade and several of her neighbors plan to fight the MVP Southgate Project as long as they can. Dear Sirs, I fail to see how Mountain valley pipeline Southgate will benifit anyone in the Reidsville N.C. Area, nor in Alamance county. If you look at the enclosed population increase for Reidsville N.C, by 2020 https://demography.cpc.unc.edu/2017/07/05/examining-decline-in-north-carolinas-municipalities/ , you will see we are ranked 10th on the list. The largest growth is in the Raliegh area. Your pipeline ends in the small Town of Haw River. My question is Why? The suburban Stats here, https://suburbanstats.org/population/north-carolina/how-many-people-live-in-haw-river , show they only have a population of 2298 people. Why does this small town need a pipeline?